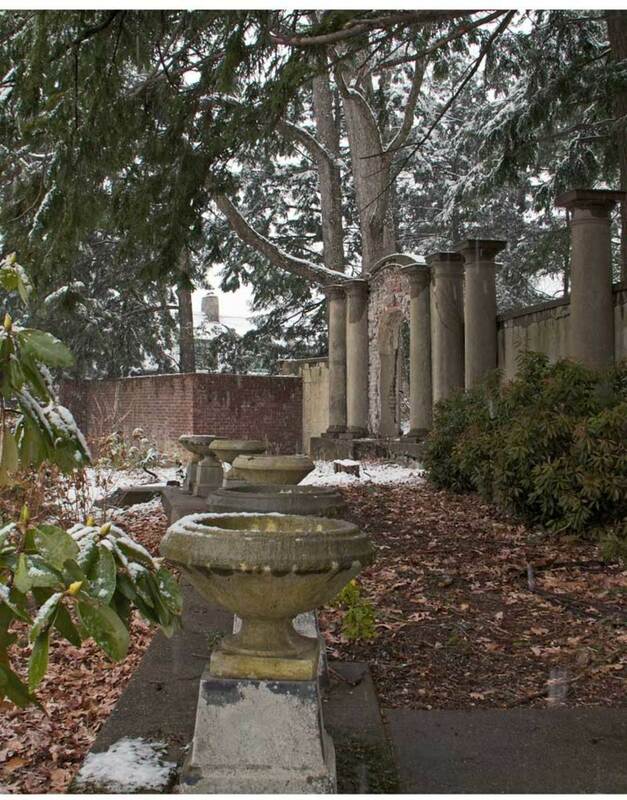 At Greenwood Gardens in New Jersey, the pergola is vivid in winter. 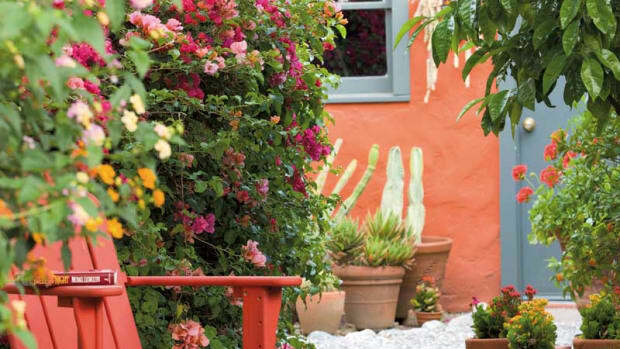 For a bungalow or cottage, create an Arts & Crafts garden that holds off-season appeal. 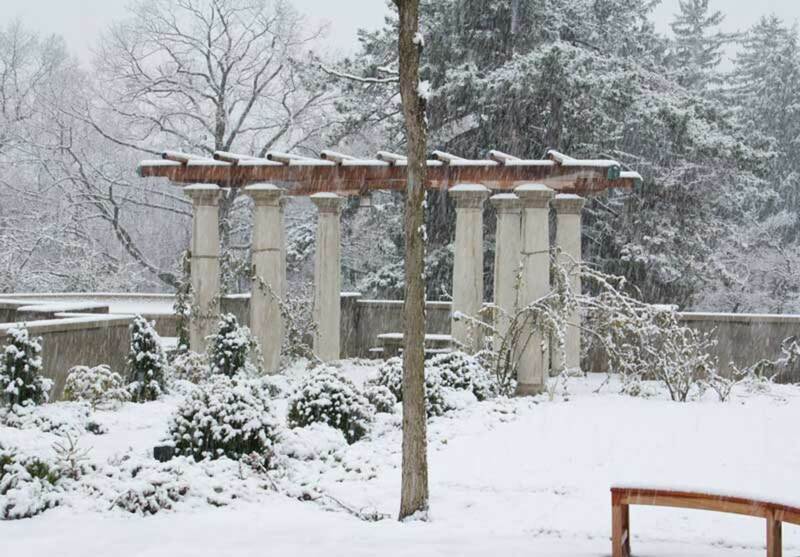 Consider architecture in the snow—a pergola or gate, stone walls, the rhythm of a fence. 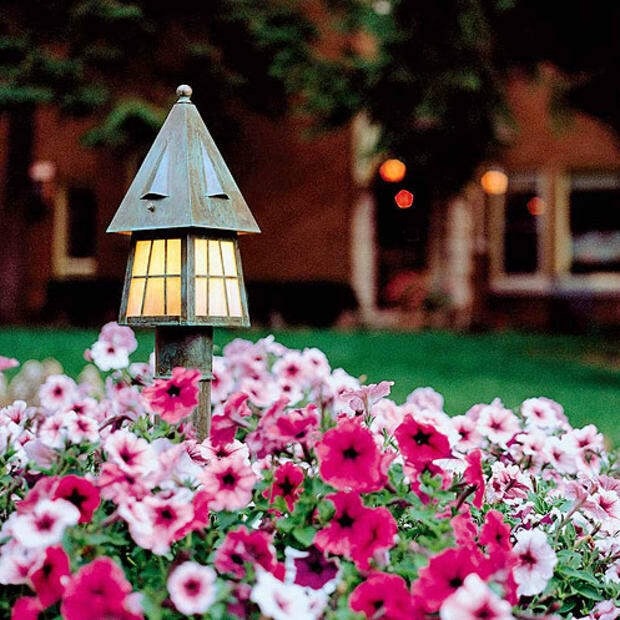 Use garden ornament or large shrubs to create focal points. 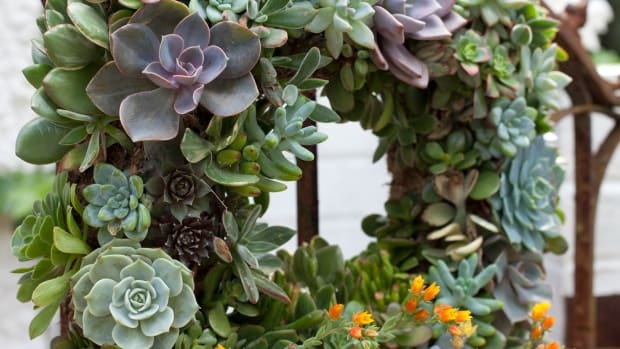 Rely on plants that are stalwarts when it comes to late fall and winter interest. Perennials may lie beneath the snow and deciduous trees are but silhouettes, yet the garden remains. A great garden never slumbers. 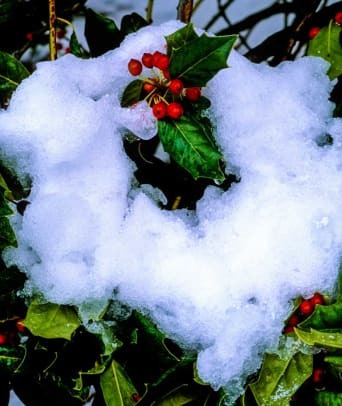 In fact, garden designers argue that winter is when a thoughtfully constructed garden really shines. The secret lies in selecting elements that stand out when the garden is stripped down to its bare-naked truth. In many parts of the country, the off-season lasts for five or six months. Plan your garden accordingly, and that time can be riveting. Conifers and broad-leaf evergreens keep nature alive at Greenwood Gardens. Considering the winter damage done by deer in many regions, a fence is a wise move from a purely practical standpoint. But a fence performs critical visual functions as well. A fence contains a space, announcing “a garden lies here” even when the evidence is partially buried. Solid stockade fences may look more like blank barriers and less like art—if you must put one up, consider softening it with birdhouses or other embellishments. On the other hand, wooden zigzag, picket, rustic, lattice, and wrought- and cast-iron fences (apropos for Arts & Crafts homes) become eloquent when their lines stand out against the snow. Even purely utilitarian wire stock fencing gains prominence and character, suggesting delicate lacework. Fences give winter birds a stable place to perch. Unpruned, the meandering stems or branches or vines add a weaving rhythm against the straight lines of a fence (or arbor). Wisteria is a heavy load to shoulder, but you can select lonicera or clematis. A gate may provide the opportunity to add color, perhaps matching body or trim on the house. When competing visual elements are erased, our color-starved eyes go straight to a handsome gate. It’s hard to go wrong with a stone wall—no matter what type you select, a wall divides space while providing strong texture in the quiet landscape. When the thaw finally comes, stone walls return to color even before the world turns green. 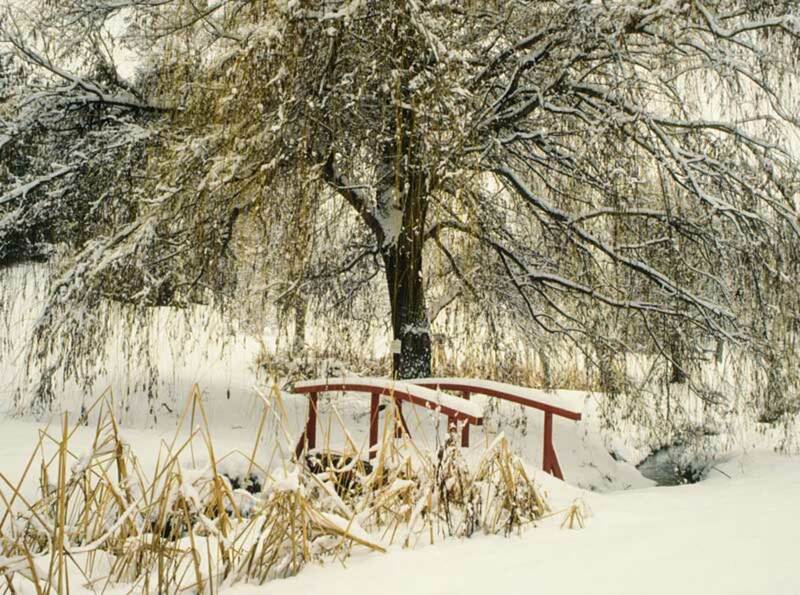 Snow draws attention to the willow and a red bridge in a private garden in British Columbia. Pergolas, arbors, and freestanding gazebos punctuate the garden. 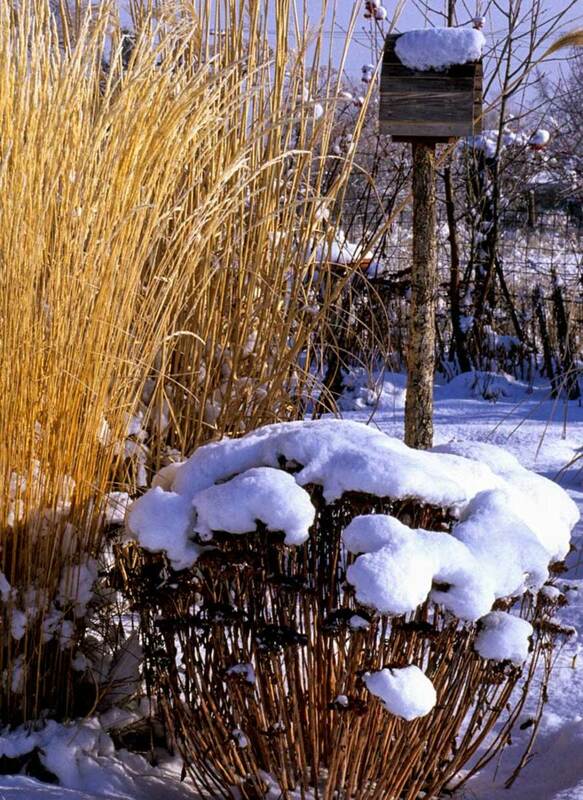 Stark against the sky or wearing a snow cap, garden structures hunker down and look magical in the winter. They also give birds shelter. 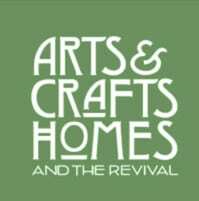 All sorts of styles, from rustic to Spanish to classical, work in an Arts & Crafts setting. Even a tool shed provides interest and can be styled to reinforce an Arts & Crafts theme, perhaps through windowboxes. Cedar or metal tuteurs gain prominence when denuded; multiple tuteurs marching down an allée are particularly eloquent. 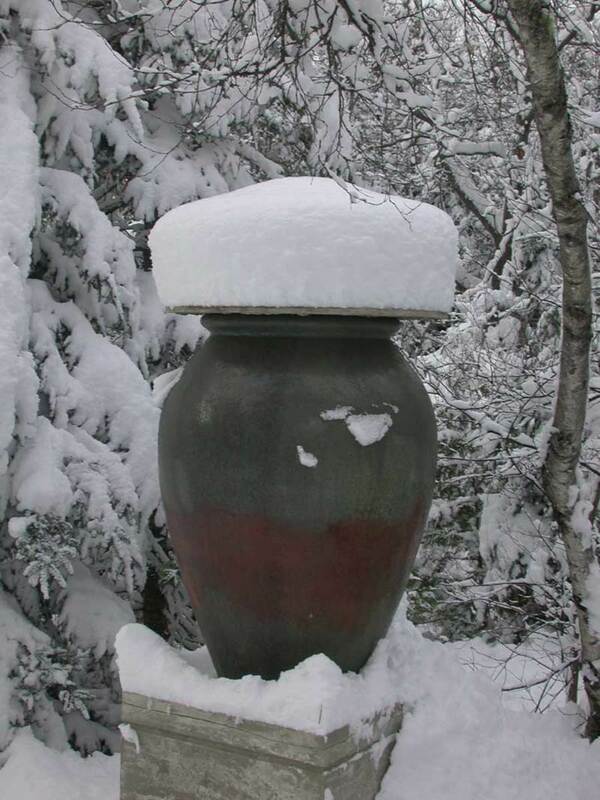 Lunaform’s ‘Ebro’ urn with a snow lid in place. 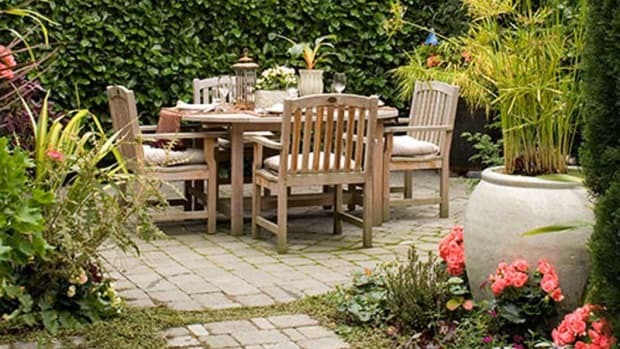 Cement orbs, ornamental hose guards, birdfeeders, and containers provide focal points or mark paths. 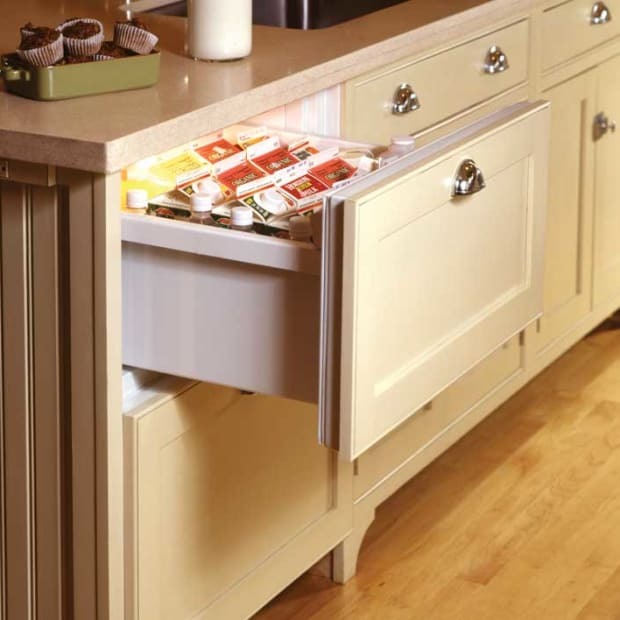 Be aware that most pots will not survive a freezing winter uncracked. 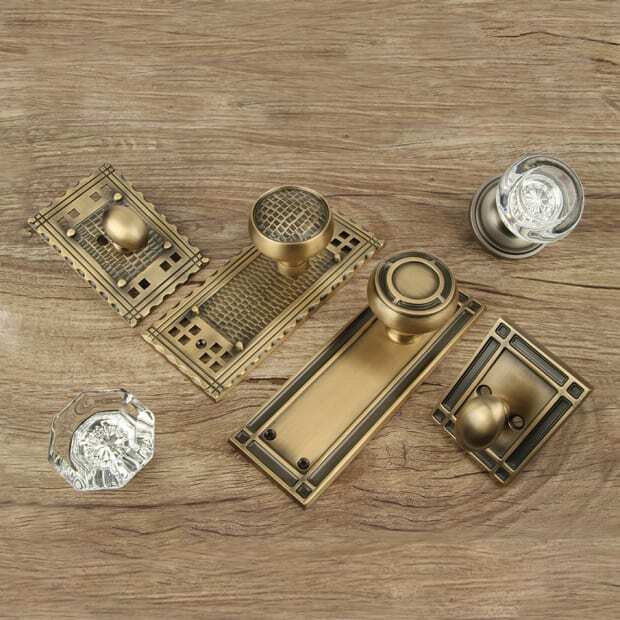 Some containers, like the reinforced urns and pots by the Maine company Lunaform, are designed to be left out; follow recommendations. Pottery birdbaths may be ruined; stone is a safer bet. Statuary is poignant in the barren garden, but much of it, too, should not be left out unprotected. Most homeowners choose to protect statuary by bundling it up in attire to deflect moisture and thus protect against freeze/thaw cycles. Grasses and stonecrop heads in the snow. The lushness of summer fades in the dormant garden, but wintertime can be filled with botanical interest if you plant accordingly. Place evergreens to define contours. 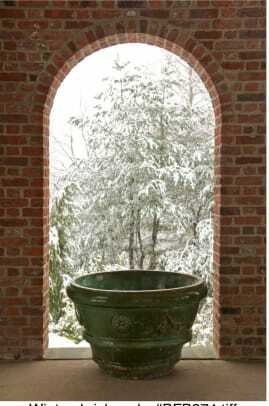 You’ll look out to see boxwood in the snow and think: That’s where my garden is. Get a psychological boost knowing the landscape is there waiting. Consider planting trees that have interesting bark: river birch, stewartia, paperbark maple, and Amur chokeberry. 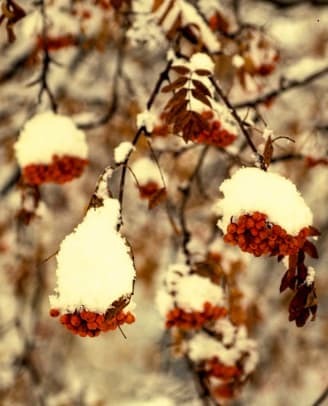 Shrubs such as red-twig dogwood, curly willows, the thorny hardy orange, and Harry Lauder’s Walking Stick have either colorful stems or “architectural” branches that become arresting when bare. To retain texture and height, rather than cutting the garden clean during fall cleanup, leave the dried seedpods of sedums and alliums, plus ornamental grasses and anything else holding intact.